Producers of the world’s biggest magic show, THE ILLUSIONISTS, join the award-winning puppeteers from WAR HORSE to present a turn-of-the-century circus spectacular. 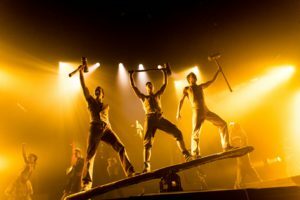 CIRCUS 1903 –The Golden Age of Circus runs May 23 – June 4 at the Music Hall at Fair Park, presented by Dallas Summer Musicals. The North Texas premier has all the thrilling entertainment expected from the circus, with a few new twists. Puppet elephants in the ring introduce a performing African elephant and her baby, along with a huge cast of unique, amazing and dangerous circus acts from around the world. Circus 1903 features strong men, contortionists, acrobats, musicians, knife throwers, high wire artists, and more. 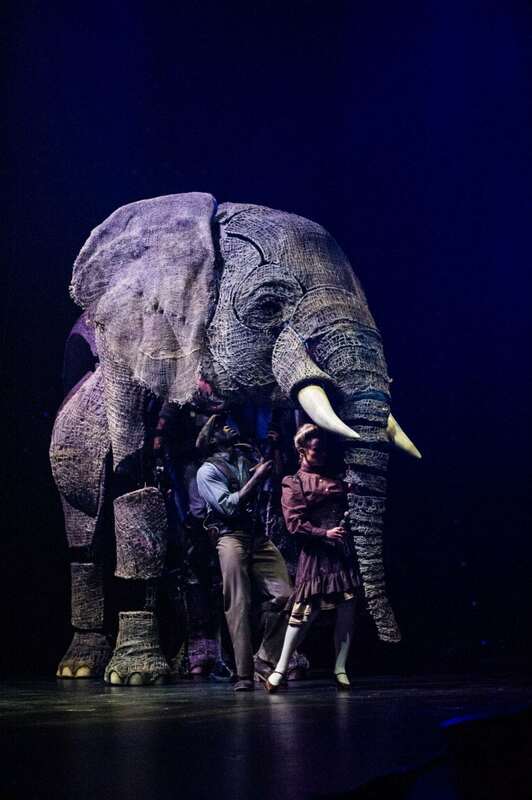 The award-winning team of puppeteers and model makers who created the National Theatre’s WAR HORSE have designed, built and brought to life two stunningly beautiful elephants for CIRCUS 1903 –The Golden Age of Circus. Featuring groundbreaking advances in design and expression, the puppets appear throughout the show as the mother teaches her calf the tricks of the trade. No circus would be complete without its music. The soundtrack of CIRCUS 1903 –The Golden Age of Circus encapsulates the time period and accentuates the thrill and danger of the acts. It is composed by Evan Jolly, composer of many of Painter and Lawson’s international hits. Dallas Summer Musicals will also have a group of musicians for every performance that will play time period tunes in the lobby of the Music Hall. Single tickets for CIRCUS 1903 – The Golden Age of Circus, start at $20. Tickets are on sale at www.DallasSummerMusicals.org or by phone at 1-800-745-3000. Groups of 10 or more receive a 15% discount, priority seating, and many more benefits. Please call 214426-4768 or email Groups@DallasSummerMusicals.org. Dallas Summer Musicals’ 2016-2017 Broadway season closes with the romantic thriller based on the hit film, THE BODYGUARD, July 18-30, starring Grammy® nominee Deborah Cox. Dallas Summer Musicals’ 2017-2018 Broadway season will kick off with the season add-on IRVING BERLIN’S WHITE CHRISTMAS, December 5-10; followed by THE COLOR PURPLE, Jan. 23 – Feb. 4, 2018. Next will be ON YOUR FEET!, Feb. 27 – Mar. 11; WAITRESS, Mar. 28 – Apr. 8; LES MISÉRABLES, Apr. 24 – May 6; DISNEY’S THE LION KING, Jun. 13 – Jul. 8; LOVE NEVER DIES, Jul. 24 – Aug. 5; and SCHOOL OF ROCK, Aug. 15-26. Dallas Summer Musicals’ seven show season tickets start at $150 and are on sale online at DallasSummerMusicals.org, by phone at 1-866-276-4884 Monday – Friday from 9 a.m. to 6 p.m. Previous article2017 BMW 530i – WOW! Do I Miss My Ex! Next articleMansfield ISD Bond Approved, Now What?